This life-changing journey is an ordered, systematic approach to develop and balance all the important areas of life, our health, career, relationships, finances, living conditions, and spirituality. Rather than utilizing so much energy RESISTING (for example, resisting exercise, meditation, eating and/or drinking healthily), we utilize that liberated energy for MIRACLES and for CREATING, which puts us on a similar vibration as our Creator. We become empowered to join with G-D and become co-creative, proactive manifestors of our dreams, desires, and goals, fulfilling our destinies. This Clair-Ascension® Kabbalah course is unique because we experience the Kabbalah. We do not read about the Tree of Life in a book and simply talk about it. We experience each aspect of G-D, in the Tree of Life. Real life situations are presented to us that help expand our awareness, enabling a new, higher choice, rather than a limiting, old way of operating. We begin with the more grounded, earthly aspects or spheres of the Tree of Life, and then progress up to the more emotional and mental, then spiritual. First we immerse ourselves in material creation in the "Kingdom" of the physical, with the four metaphysical elements: earth, water, air, and fire. We work on creating inner and outer health and abundance, organization, and improved living conditions. In the next sphere of the Tree of Life, we come to terms with our sexuality and our relationships, including developing a personal relationship (or a deeper one) with G-D, laying a sturdy, independent “Foundation." 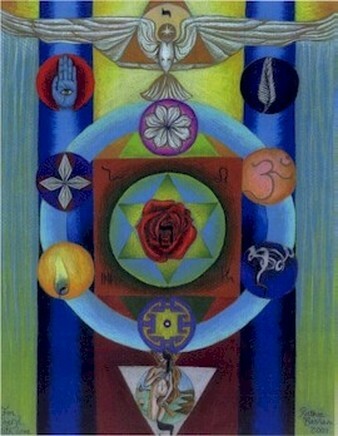 We then move up to the sphere of "Splendor" (creating magic from our limitless Spirit) and "Truth." Independence is a prerequisite. If we are dependent on someone for something, we may fear that if we speak our truth, we may lose what we perceive we need from them. Honest communication is an integral part of this sphere. After we choose "Integrity" consistently, we are then ready to move up to the next sphere or aspect of G-D, "Victory," particularly "Victory over Emotions." How can we master our emotions if we are not totally honest with ourselves and with others first? Now with our familiarity with physical manifestation, independence and relationships, with our clarity and honesty, and mastery over emotions, we are a pure vessel for the flow of Divine Energy that enables us to express ourselves creatively. This moves us into the Sphere of “Beauty” and “Unconditional Love." In order to prepare for the privilege of ascending into the next qualities of G-D, courage and power, we must complete any necessary healing (especially forgiveness) that may have slipped through the cracks throughout the first four spheres. Now that our healing and forgiveness are sufficient, we are ready to be “Severe” when necessary, that is to stand fully in our power, to exercise "tough love" when needed. However, in order not to abuse power, we must temper that with the next sphere, or aspect of G-D, with lovingkindness. With “Mercy” and “Lovingkindness," we are much less likely to abuse our power. With lovingkindness, we learn to speak our truth with love, rather than with anger. Once we have mastered this power balance between severity and mercy, we are privileged to move into the hidden sphere of tremendously increased "Knowledge." Here we may experience a “Dark Night of the Soul." Our core issues may surface. We allow ourselves to delve into the depths of our emotions, to reconfigure the issues with new knowledge, and to emerge with a completely new spiritual perspective. We evolve exponentially. In order to use "Knowledge" and that Inner Knowing for the highest good in a G-Dly manner, we must ascend to the spheres of "Understanding" and "Wisdom." We finally reach the highest sphere in the Tree, the "Crown." Here we work on spiritual connection in a way that works for each individual, as opposed to any religious dogma. The "Crown" is the jurisdiction of the Archangel Metatron, the King of the Archangels, whose primary function with humans is to empower humans, greatly impacting the destiny of humans. The Crown represents Attainment of the Great Work. It is the "I AM" presence, learning how to live in the "NOW" moment, as opposed to regretting the past and worrying about the future. This Kabbalah journey takes approximately thirteen months. We meet once a month for thirteen months, culminating in a fourteenth month with a spiritual retreat. Afterward, the Kabbalah becomes a way of life. We embody the aspects of G-D, creating a Divine Union to bring this divine energy through us, to create Heaven on Earth in all areas of our lives. We grow very close to those who traverse this holy ground with us. When one studies Kabbalah, one's productivity can increase tremendously! The reason is that we learn about the Four Worlds in Kabbalah. In the First World, we first Receive a Divine Spark. In the Second World, we Contemplate the Idea. In the Third World, we Formulate a Plan. Finally, in the Fourth World, we Take the Action Steps necessary to bring that Divine Spark all the way through our Tree of Life into physical manifestation. The Fifth World in Kabbalah is the highest, the Adam Kadmon, the Full Light Body Activation, which allows us to utilize this infinite light, power, and energy to bring each Divine Spark and Divine Blueprint into physical fruition. FASTEN YOUR SEAT BELTS! OUR AMAZING ADVENTURE IS ABOUT TO BEGIN! although arrangements can be made for alternative locations and online attendance. ﻿$120﻿ per hour (usually lasts anywhere from 1 - 1 1/2 hours). Cost based on time utilized. Each session may vary.